Amy Federko, 4-H volunteer and Blaine County Fair board member, was dragging fields in the Heatherlands on Wednesday, preparing to resurrect an old horse arena into a place where kids can come ride and learn about horses—without having to own one. Lest anyone think otherwise, Federko is clear that not owning the horses doesn't mean the kids won't have to take care of them. "I'm not going to be standing there with their horses saddled," she said. "This is learning about horses. Everybody has to muck stalls." 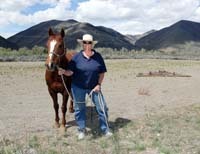 The idea for a "horse rental" class came to Federko last year, she said, when Blaine County almost revoked funding for the 4-H program during its budget process. Though that proposal was stymied by a public outcry, Federko said she realized that the 4-H program had to expand into areas where kids might not actually be able to keep animals but might still have an interest in taking care of them. Most of the program's current participation comes from Carey and Bellevue, Federko said, and so Ketchum, Hailey and Sun Valley were ripe for expansion. "If we don't get north valley kids involved, 4-H might not exist in our county," she said. "This program will boost our numbers, and then there won't be a question [that 4-H is worth funding]." Federko will be working with Cindy Jones, program director for Two Hearts Horsemanship at the Sunshine Acres Children's Home in Mesa, Ariz. The program in Arizona has agreed to lend Federko and 4-H 10 horses and five miniature horses for the summer—a win-win for both the programs and the horses, Federko said. "Those horses can barely stand it in Arizona in the summer," she said. "It's 118 degrees there." Two Hearts North will pay to transport the horses to and from Arizona, as well as provide for them while they are staying at the Heatherlands Horsemanship Facility mid-valley, just south of East Fork Road. But the arena itself is abandoned and neglected, which is why Federko was out "dragging" the fields, or smoothing them and preparing them for riding. Federko estimates that it will cost $5,000 just to refurbish the facility and $10,000 for horse transportation, plus money for rent, insurance, feed and scholarships for those who can't afford the program's $300 fee. Federko said all the money would be privately raised from donors and foundations. So far, the Deer Creek Foundation, the Campfire Girls, and Ketchum-Sun Valley Rotary have all donated what Federko calls "seed money" for the program's startup. "There's no money from the county, no money from 4-H," she said, though the 4-H Leadership Council has given money toward scholarships. Still, she said she is far from her goal of raising $50,000 to get the program off the ground—not that she has given up yet. "I have to do something to help this happen, or everyone is going to suffer for it," she said, adding that 4-H participation needs to increase or the program will risk defunding for a second year in a row. "I want 4-H to help weave a common thread among kids from Carey to Ketchum," she said. Blaine County Commissioner Larry Schoen said he was a proponent of the project, which he said would benefit the 4-H program as well as kids in the north valley. "It's great to give kids throughout the valley a chance to interact with animals," he said. "There is a lot of interest in horses among kids in the north valley, and I think it's great Amy is willing to share her passion for this with others." The deadline for signups will be May 9, when the program will have a mandatory meeting at 6:30 p.m. at the Grange Hall in Hailey. Weekly meetings will begin the week of May 14. Children from ages 8-18 will learn to care for and ride horses, while children ages 6-7 will learn the proper care of horses by working with the miniatures on loan from the Arizona program. For more information, call the University of Idaho Blaine County Extension Office at 788-5585 or Federko at 720-7381.